BELBROUGHTON : Christenings, Marriages & Burials 1615-1700 (BTs) [Microfilm.] Published Salt Lake City : Genealogical Society of Utah, 1960 BELBROUGHTON: Christenings 1540-1948, Marriages 1540-1904, Burials 1540-1897, banns 1754-1823, land & owners in 1620 [Microfilm] Published Salt Lake City Genealogical Society of Utah 2008 Source S: S Groocock. BELBROUGHTON (Holy Trinity) : Monumental Inscriptions: Worcestershire monumental inscriptions vol. 13 [Typescript.] IN: Worcestershire monumental inscriptions vol. 13 Published Birmingham : Birmingham & Midland Society for Genealogy & Heraldry, 1993 Author Birmingham & Midland Society for Genealogy & Heraldry (trans.) Source D: Birmingham & Midland Soc. for Genealogy & Heraldry. 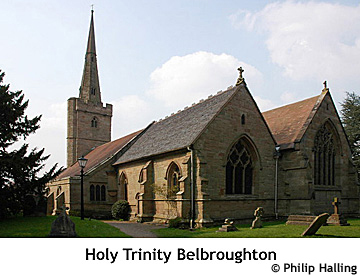 BELBROUGHTON, a parish in the lower division of the hundred of HALFSHIRE, county of WORCESTER, 5 miles (N. W. by N.) from Bromsgrove, containing 1476 inhabitants. The living is a rectory, in the archdeaconry and diocese of Worcester, rated in the king's books at £19, and in the patronage of the President and Fellows of St. John's College, Oxford. The church, dedicated to the Holy Trinity, has recently received an additional number of sittings, by means of a grant of £ 100 from the Incorporated Society for enlarging churches and chapels. Here is an extensive manufactory for scythes, hay-knives, &c. Fairs are held on the last Monday in April, and the Monday before St. Luke's day. A sheriff's court, for the recovery of small debts, is held on the third Wednesday in every month. There is an endowment of about £10 per annum for the instruction of poor children. The parish is divided into four yields, viz., those of Belbroughton, Brian's Bell with Moor-Hall Bell, Forfield, and Broomhill.